In the previous lessons you saw that a painting gains force when you strengthen the value contrast by reducing nuances. Painting with only three tonal values almost guarantees successful work. The ability to express yourself in a limited value pattern is the most important key to learning to paint well. So: the basis for a good composition is not what you see before you, what IS there, but what SHOULD BE there. Combine similar values, avoid having too many dark accents in the light area, and too many light ones in the shade. Don’t scatter details across the painting, but limit them to the area in and around the focal point (more about that later). Rowland Hilder was a master of such a limited value palette. 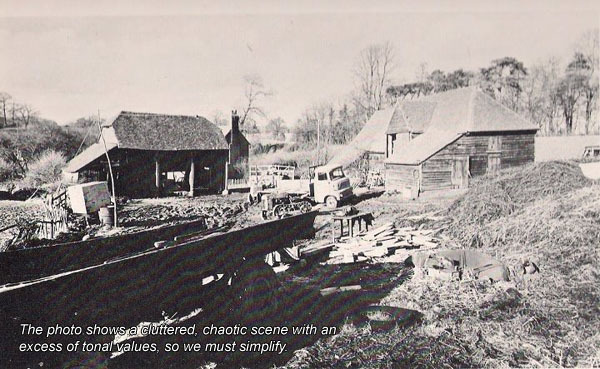 The photo shows a cluttered, chaotic scene with an excess of tonal values, so we must simplify. Turning this scene into a strong painting requires some thought. The value sketch shows that considerable changes were made, but notice in particular how the tonal values have been forged into a whole. 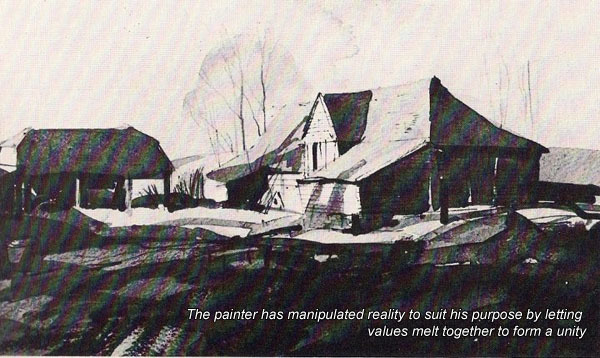 The painter has manipulated reality to suit his purpose by letting values melt together to form a unity. After all, a good painting is more important than an accurate rendering. When we merge shapes by unifying values, we achieve an increased abstraction of the overall composition. This makes for a stronger painting that transcends the “pretty picture”. Study this example thoroughly, and make a few such sketches of your own. You learn only by doing, just as someone who only reads cookbooks will never be a good cook either. Watercolor technique is not that difficult. It is made difficult by bad teachers.